www.royalvegas.com Royal Vegas Casino was established in 2000 by the Fortune Lounge group, who also own 7Sultans, Vegas Palms and Desert Dollar. Like the rest of the group it is powered by the Microgaming platform, which provides Royal Vegas players with access to over 500 games, with new games being added all the time. As well as attracting the British player base, Royal Vegas also targets the rest of Europe, and the site is available in French, Norwegian, Portuguese, Swedish, Danish, Spanish, German, Italian and Russian. The Royal Vegas homepage has a nice red and gold theme, with highlights of royal blue, which is reminiscent of one of the large Las Vegas resorts, and you can almost imagine you are spinning the slots in the Lobby of the Venetian! They certainly have Vegas sized jackpots; one of the bonuses about playing a Microgaming powered site is that the progressive jackpots can reach into the millions. Royal Vegas offers Roulette, Craps, Slots, Video Poker and Blackjack, plus a range of casino tournaments, including the International Blackjack League and the International Slots League. Gameplay can be either in the browser or via download, and the lobby holds no great surprises if you have played on Microgaming platforms before. The graphics are crisp and clear and gameplay consistent – all things you want from an online casino. Upon registration, new players can claim a whopping Welcome Bonus which rewards you for your first three deposits and could see you rewarded with up to an extra £1,200. Conveniently, Royal Vegas accepts British Pounds, Euros and Dollars, and the rewards are the same in any currency. Royal Vegas runs the same promotions as its sister sites, so you can be guaranteed of some good weekly and monthly promotions, plus a VIP scheme ad reward programme. 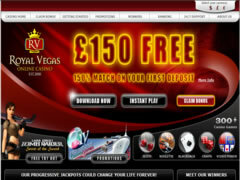 Royal Vegas offer attractive, smooth looking gameplay across their site with a fantastic choice of games, great jackpots and good rewards schemes. Of all the Fortune Lounge brands, this is clearly the jewel in their crown, and far outweighs their other sites. Takes 24hrs or so before u can withdraw - annoying if u have a good win and want to run for the hills with it. But not so bad if your planing on sticking around which i feel most of you will.